On Nov. 20, 2017, Clairton Elementary School student Journei Williams shows Jefferson Elementary School student Alivia Zulka around her school. Zion Rumble raced in disbelief through the hallways at Jefferson Elementary in the West Jefferson Hills School District. The hallways were wider, lockers bigger and there were multiple floors for just the elementary kids. Gadgets filled the STEAM lab; students have an art room and lots of bathrooms. At Clairton Elementary, where Zion attended fifth grade, everything seems smaller, and they have less. The kids repeatedly talk about how the elementary art teacher position was cut, and the art room was turned into a music classroom. Kids now learn art in their other classes, while teachers are also trying to teach English and math. As part of Pittsburgh Public Theater’s Creative Dramatics program, kids from two districts of different socioeconomic backgrounds — like Clairton and West Jefferson Hills — have the chance to learn an adaptive Shakespearean work, rehearse and perform together, tour each other’s schools and get to know one another. “Clairton better watch out. They’re going to be losing a bunch of kids when they see this,” said Zion during an October rehearsal at Jefferson, as she hugged nearly everything she came in contact with, from lockers to vending machines. “Can you give me a membership to this school?” her classmate Javian Kesner, a fifth grader at Clairton in 2017-18, said as he explored Jefferson Elementary School with her. Abby Kauffman, a fourth grader at Gill Hall Elementary in the West Jefferson Hills School District in 2017-18, seemed to understand the difference between her world and those of the Clairton students. As students from both districts ate lunch together and compared their schools, Abby said she feels lucky. “Some people aren’t as fortunate as us. I’m just very lucky my dad works a good job and we’re able to have a house and a nice school,” Abby said. On Nov. 20, 2017, students from the Clairton and West Jefferson Hills school districts participated in the Pittsburgh Public Theater’s Creative Dramatics program, where they had the chance to learn an adaptive Shakespearean work, rehearse and perform together, tour each other’s schools and get to know one another. 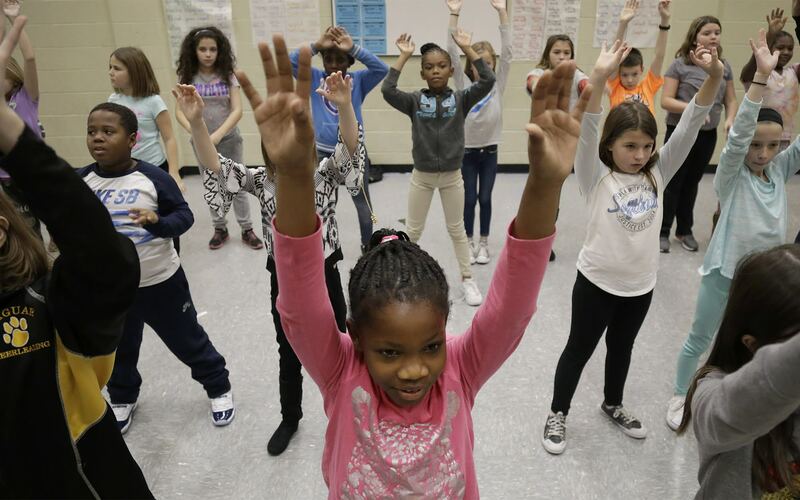 Students from the Clairton and West Jefferson Hills school districts intermingle during an activity led by the Pittsburgh Public Theater’s Creative Dramatics program in November 2017. 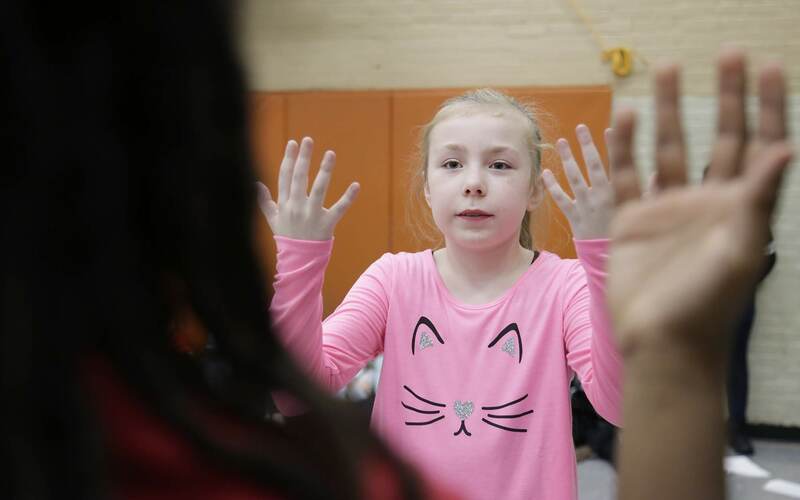 Jefferson Elementary School student Samantha Strope (right) rehearses a "mirror" miming activity with Clairton Elementary School student Teon Goodrum during the November 2017 event. While Clairton City and West Jefferson Hills school districts border each other, the two are vastly different. State and local funding play a major role, as does migration due to the economy. Clairton, once a booming steel town, has lost a lot of its residents and businesses over the decades and now struggles, while West Jefferson Hills continues to thrive. Clairton, which had a population of 12,100 people in the 1980s, had roughly 6,600 residents in 2017, according to the U.S. Census. Jefferson Hills Borough had 8,600 in the 1980s and grew to about 11,000 residents in 2017. A national study of neighboring districts with socioeconomic disparities, completed by nonprofit EdBuild in 2016, found that the Clairton and West Jefferson Hills school districts had the fourth highest disparity between bordering districts in the United States — with Clairton’s poverty rate at 48 percent and West Jefferson Hills’ at 7 percent. “That’s all of it right there,” Clairton Superintendent Ginny Hunt said in February, referencing the numbers. PublicSource spent time during the 2017-18 school year in the Clairton and West Jefferson school districts documenting the disparities between the two. While both districts are known for their elite football programs, their education systems and funding sources vary greatly. They are an example of the disparities in education funding, and the resulting gaps in resources, described in a lawsuit pending in Commonwealth Court. 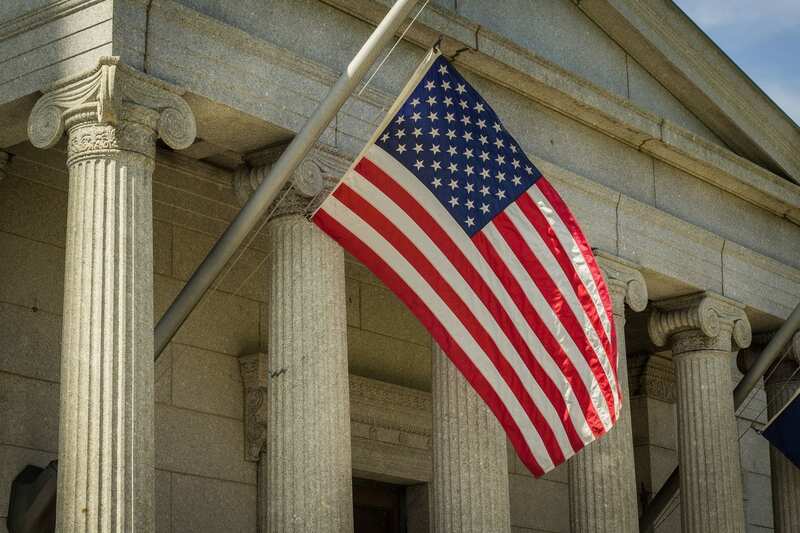 The plaintiffs — a handful of school districts, parents and students — want the court to order the state Legislature to devise a more equitable funding formula than the current one, which relies heavily on local real estate taxes to fund schools. Year after year, Clairton faces cuts to teachers and staffing, old structures they can’t afford to fully repair and gaps in facilities and programming. “We’ve had to cut ourselves to the bone to survive,” Clairton board member Roger Tachoir said in April. 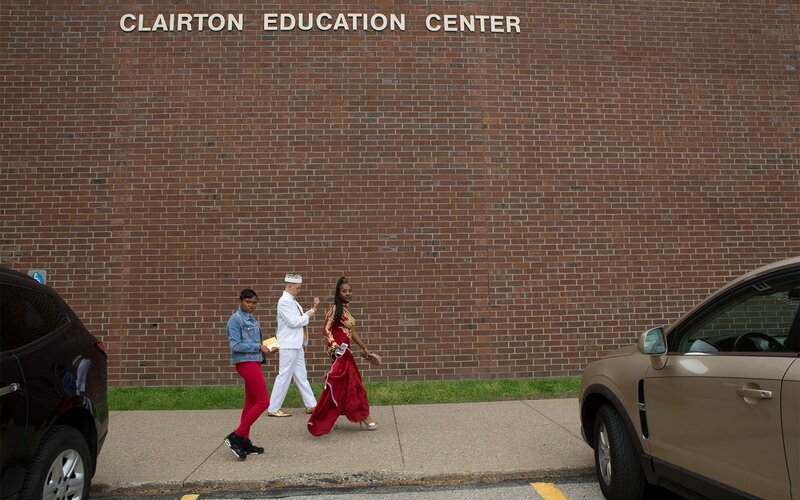 In 2018, the graduating class at Clairton was 53 students — a number that has dropped over the decades. However, the number of graduates has stayed between 41 and 74 in the last 14 years. Next door, West Jefferson Hills is experiencing steady growth of new houses and students, graduating about 217 students a year. A feasibility study conducted in 2017 showed the district’s need to expand its elementary buildings because of the growth. This, along with building and curriculum upgrades, are underway as the district strives to be at the forefront of education in the region. 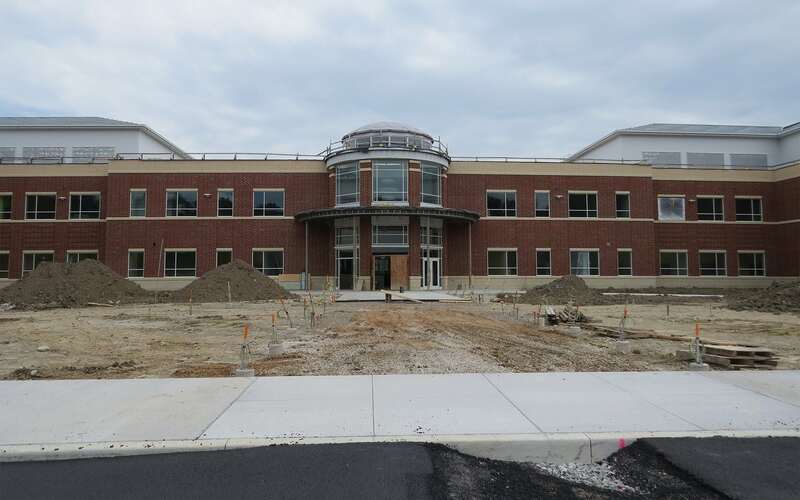 The district is in the final stages of building a new $95 million high school patterned after Thomas Jefferson’s Monticello, with grandiose rotundas and white pillars, that harken back to the home of the school’s namesake. District leaders say the new school is needed to improve the educational experience — with expanded special education, art, music and business classrooms. And while Thomas Jefferson’s high school students will have a host of new opportunities in the new building, Clairton high school students are learning on one floor of a school renovated in the late 1980s. Set to open during the 2018-19 school year, the new 300,000-square-foot Thomas Jefferson High School will include two classroom wings with a focus on collaborative learning, outdoor learning spaces and a multilevel glass-enclosed multimedia center. The disparity has been showing itself in academic achievement. Clairton Middle/High School scored a 47.6 on the latest School Performance Profile (the score is out of 107). Thomas Jefferson High School in West Jefferson Hills scored 86 and Pleasant Hills Middle School scored 81.7. Leaders from both districts agree it’s not fair the way school districts are funded in Pennsylvania, and something has to change. 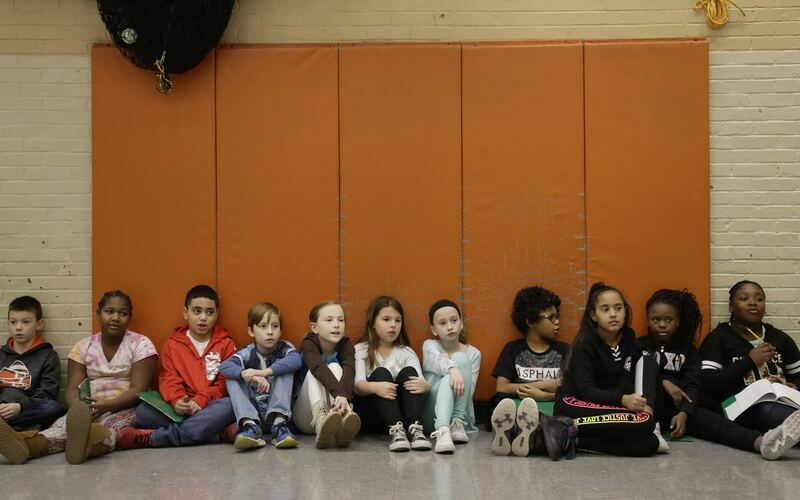 “I think we as United States citizens have a right to ensure equity and a good education for every child within public education, and it’s sad to see the school districts that don’t receive adequate funding,” West Jefferson Hills Superintendent Michael Ghilani said. Lauren Weatherspoon dreams of moving to New York City someday and becoming a playwright. The Clairton senior loves theater. Yet, at Clairton high school, she doesn’t have much opportunity to act. The school has no theater program. There’s an auditorium, but no fall play or spring musical, unlike most Western Pennsylvania districts. No drama club. The only programs offered in recent years have come from outside organizations, like Prime Stage Theatre’s Literacy in ACTion program and the Clairton Writes! program, made possible with a grant from the Heinz Endowments*. 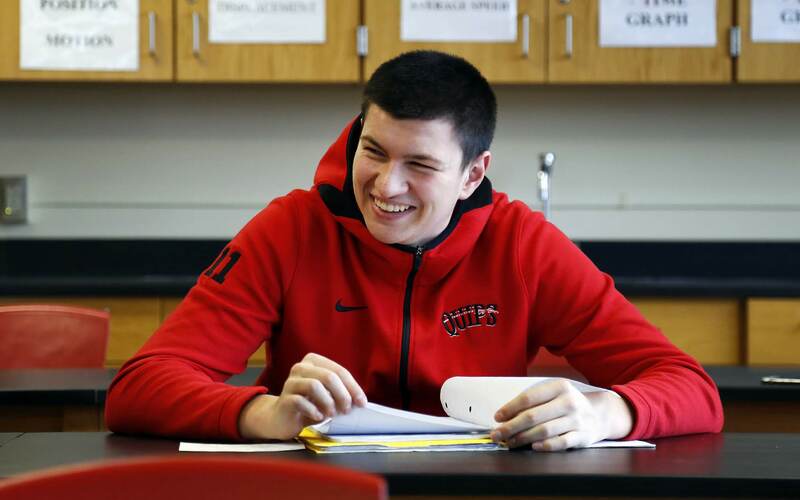 Students have come to expect that if they want an extra program — athletic or extracurricular — at their school, the district has to get a grant or it doesn’t happen, they said. It always goes back to money and the lack of students wanting to participate. For Lauren, if she wants to learn theater, she has to go outside the district. She has taken summer programs in the past, thanks to a scholarship. 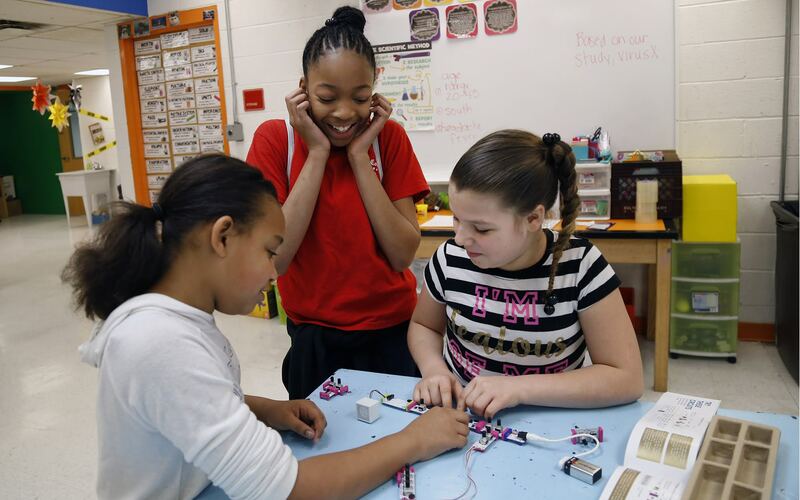 In May, Clairton Middle/High School student Lauren Weatherspoon (center) worked with classmates Abigail McGee (left) and Wendy Florenz (right) during a robotics class. Lauren’s classmate Celina Maselli, now a senior, spoke in February about working at Olive Garden with students from neighboring districts. She hears them talk about their “favorite time of year” — musical season. But she doesn’t know what that’s like. She thinks it would be fun and maybe some students at Clairton would even find their niche. But they’ll never know without the opportunity. Jayla Hamlin, now a senior, feels the same way. “It’s like, dang, I could have missed out on something that I could have really enjoyed,” she said. In college, she will probably take a musical theater class as an elective, just to try it, because she didn’t have the chance at Clairton. “Because it’s not offered here, I won’t have any experience and I’ll feel left behind,” Jayla said. Lauren knows this puts her at a disadvantage. But it makes her work harder. That’s the way it is for a lot of students in Clairton. “So you know when you want to be a playwright,” Trubiani said, “you’re going to have to work twice as hard to get the little things because she didn’t have that beginning. But that doesn’t mean she can’t do it.” Clairton graduates have gone on to do big things in their lives, Trubiani said, they just had to work harder to get there. Thomas Jefferson High School in West Jefferson Hills conducts a fall play and spring musical each year. The majority of the program is self-sufficient, Ghilani said. The only district funds used for the productions are additional staff time, Ghilani said. The musical director earns a stipend of $3,000 from the district. West Jefferson Hills also created a theater director position in June, at a $7,000 salary, to work at the new high school. The new Thomas Jefferson High School [TJ], slated to be complete sometime during the 2018-19 school year, has a wing focused on the arts with a 1,000-seat auditorium. The current TJ auditorium seats about 700. 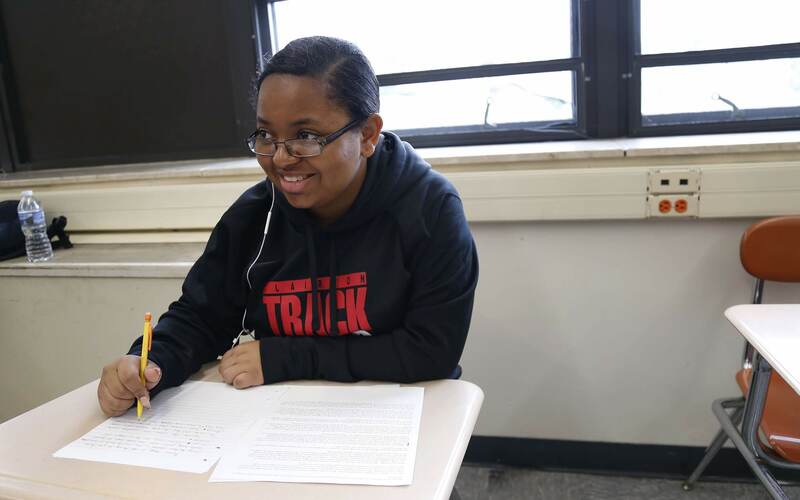 Jayla raised another concern about not having enough Advanced Placement [AP] classes at Clairton high school to prepare her to compete equally with others. With fewer AP offerings, her grade point average is lower. That’s a concern for students at Clairton. They fear colleges will pick kids from better schools. “They’re definitely going to choose (someone from a school that offers more) over us with a lower GPA because we didn’t get the same opportunities,” Anastasia Snowden, now a senior, said in February. Clairton high school offers five AP courses and four college-in-high-school classes, middle/high school principal Tom McCloskey said. Thomas Jefferson offers 12 AP courses, and administrators are discussing adding more. 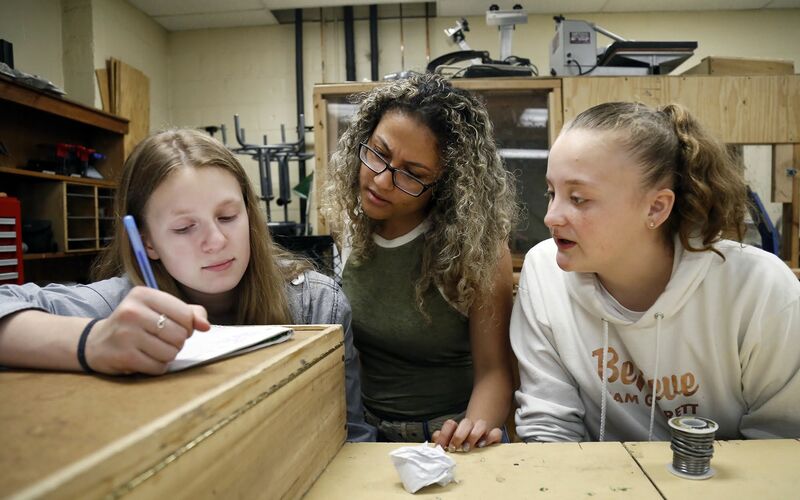 Clairton Middle/High School student Jayla Hamlin, seen here last May during her junior year, writes about nuclear energy in a physics class. Jayla has her entire life planned out: She’s going to graduate from Clairton, attend four years of college, where she will likely major in political science. Then, she may attend law school. She hopes it will position her to climb the ladder from state representative to senator to president of the United States. She gets her drive to participate in politics from her grandmother, who was on the Clairton school board in the 1990s and 2000s. Her grandfather and mother also served on the school board. Growing up in Clairton, Jayla said, can be a positive and a negative. It’s all what you make of it, but she really doesn’t want a number she can’t control to hold her back from her dreams. Transportation is another issue illustrating the needs in Clairton, a walking school district. Every student, no matter where they live in the district, needs to walk to school every day or get dropped off. District leaders have discussed adding buses for years, board president Richard Livingston said. But that costs money and would mean increasing taxes — as much as a $400 increase per taxpayer. Residents don’t want that. They turned down a referendum several years ago that would have added transportation in the district. Clairton would be able to afford transportation if it didn’t have to pay more than $2.2 million to send students from the district to charter schools each year, Livingston said. 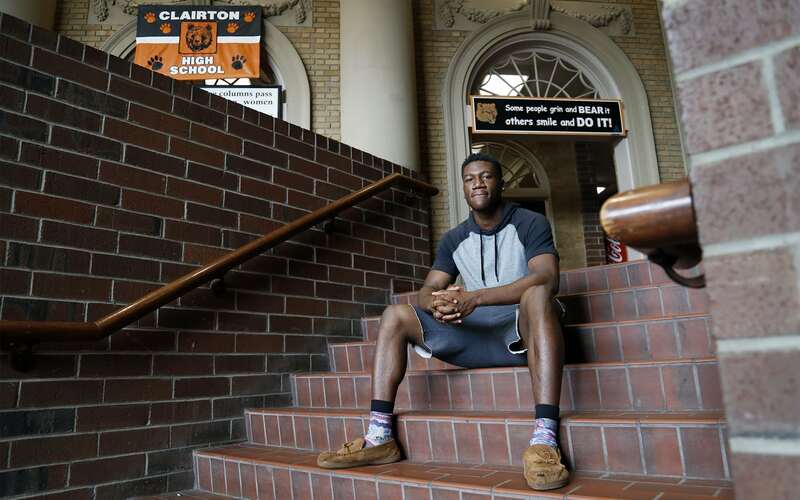 For senior Leonard Robinson III, who plays baseball, football, basketball and track (all four sports Clairton offers), his daily 2.5-mile walk is at least 45 minutes to and from school. Clairton Middle/High School student Leonard Robinson III, photographed in May. He doesn’t mind it. He enjoys the time to himself to think. For Leonard, one thing that does bother him at Clairton is the lack of opportunities for athletes, he said during a February interview. There is no track at Clairton. The track team has to practice for track meets by running in circles around the outside of their school and sometimes in the hallways and up and down the stairs. “Sometimes the first time we step on a track is at a track meet,” said Celina, who also plays on the boys’ baseball team, because there is no girls’ softball team at the school. She doesn’t mind it. Her aunt did it many years ago. West Jefferson Hills athletic director Bill Cherpak has offered to let Clairton’s track team use the TJ track to prepare for meets. The way Pennsylvania funds its school districts, property taxes — and how much you pay for them — can be a major factor in determining your child’s education. West Jefferson Hills and Clairton are salient examples of that. According to the U.S. Census American Community Survey for 2012-2016, the median household income varied in the West Jefferson Hills School District from $79,615 in Jefferson Hills Borough to $68,453 in Pleasant Hills Borough and $47,667 in West Elizabeth. In Clairton, it was $30,513. When you have an area with higher incomes and newer houses, such as West Jefferson Hills, it’s easier to bring in more money. West Jefferson Hills operates on a roughly $53 million budget for its 2,900 students, while Clairton spends about $16.1 million a year to educate about 800 students. However, the Clairton school district has to divert more of its budget than West Jefferson does to charter school tuition. The majority of West Jefferson Hills’ revenue comes from local taxes, from which the district brings in $37 million, or 71 percent of its revenue, said district public relations coordinator Carrie Lekse. It also collects $15 million from the state, or 28 percent of its revenue. Clairton, however, only gets $3.4 million from local taxes, or 22 percent of its budget, said business administrator Larry Nicolette. Another $11.1 million, or 71 percent of its revenue, comes from the state, and about 6.4 percent came from federal dollars. “It’s the local economy,” said Tachoir, who taught at Clairton high school for more than 30 years and serves on several area boards, including the Allegheny Intermediate Unit board of directors. Livingston said his house is just across the border from West Jefferson Hills, where he estimates his property taxes would increase by three to four times. “Our housing stock is old, the housing value is going down,” he said of Clairton. Also, much of the district is rental properties, Livingston said. The census shows 59 percent of the district’s housing is owner-occupied. Property tax increases wouldn’t be enough to help Clairton, Nicolette said. One mill in Clairton generates $111,300. (In West Jefferson Hills, one mill brought in about $1.4 million in 2017-18). Clairton would need to raise property taxes by more than is allowable under the state’s Act 1 in a given year — or multiple years — to bring in anything that would make a difference. Clairton raised its property taxes for the first time in several years in 2018-19, Nicolette said in August. The library at Clairton Middle/High School sat empty on a busy Thursday morning in early May. It’s that way most of the time these days. The chairs are lined up and a smartboard sits in front of the room. It’s only used if a teacher brings a class in to work. The librarian position was eliminated in the last few years. Even before the position was eliminated the use of the library had declined, which was partly due to the fact that each middle and high school student in the district now has a Chromebook, Trubiani said. Every student in sixth through 12th grade is given a Chromebook to use and students in grades nine through 12 can take them home. This program has been in place for several years and students say that’s one of the few ways they’re actually comparable with their peers in other districts. In 2011, Clairton made drastic cuts to its staffing. In the last five years, another five full-time and one part-time position were eliminated. That netted a savings of $660,000 a year. Hunt now works as superintendent, director of curriculum, human resources and professional development director. For budget reasons, they had to get rid of the assistant superintendent as well. “There’s no other place to cut,” Livingston said. West Jefferson Hills, on the other hand, added two assistant superintendents in the last year. “We’re growing too fast. We couldn’t [cut] if we wanted to,” Ghilani said, also pointing to the district’s steady tax increases over the last six years that will help fund the new high school. 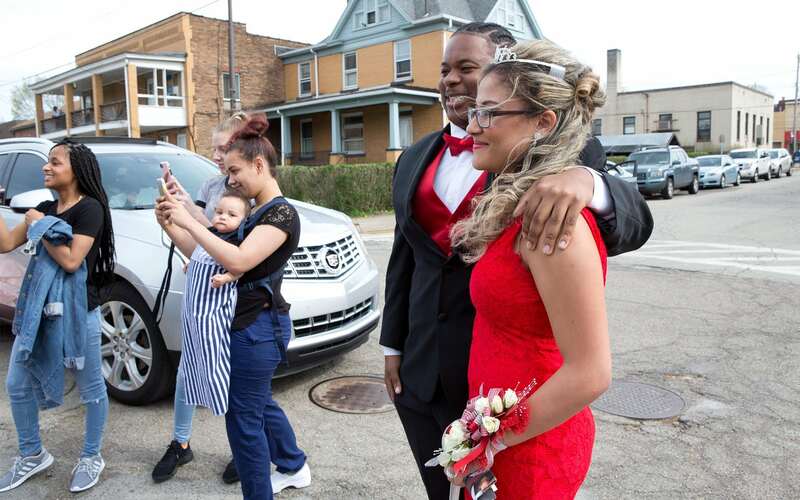 Prom King Andress Wiggins and his date Alanna Holly (right) outside the school after the 2018 Clairton Promenade. Ghilani pointed out that many high-achieving districts have had steady tax increases over the years to fund their programs and facilities. Districts in Pennsylvania today are often faced with the choice: raise property taxes or cut staff, Ghilani said. “Districts are cutting teachers, people are losing their jobs and people’s taxes have been steadily going up,” he said. The Clairton district had about 100 teachers and paraprofessionals in 2011. Today, it has 84. “We’re never going to get back there,” Livingston said. McCloskey envisions the library could be transformed into a makerspace, but, once again, the question is staffing. Staff at Clairton is spread so thin that any extracurricular programs need to be incorporated into the day, he said. Computer science will be a focus at the middle/high school this upcoming year, Hunt said in February. “We can’t afford to go out and hire a computer science teacher, so we will have to get other teachers to take on those responsibilities and roles,” Hunt said. She also would like to add a STEAM teacher at the elementary schools, but there’s no money. Hunt said the students need more support staff. Counselors and administrators at the middle/high school right now are at a minimum. “In light of everything going on, I think the more adults you have in a support role, the safer it makes the school,” Hunt said. The district does have a booming robotics program that ties together manufacturing and engineering. It has received donations and operates the program as a class. The students want more — along with activities after school to keep them busy. But again the issue is money. Sprawled out on 161 acres off of Old Clairton Road, the new Thomas Jefferson High School is a showstopper. Set to open during the 2018-19 school year, the 300,000-square-foot school (100,000 square feet more than the current high school) will include two classroom wings with a focus on collaborative learning, outdoor learning spaces and a multilevel glass-enclosed multimedia center. Academics will be at the center and sports and arts wings will flank the building. Director of facilities Ryan Snodgrass talks about how band students could record their music inside the multimedia studio, while art students design the CD cover and business students market the product in the community. The new school is being funded through a series of bond issues and use of some funds from the district’s $34 million fund balance. Seven years of planned tax increases will help pay off the bonds. 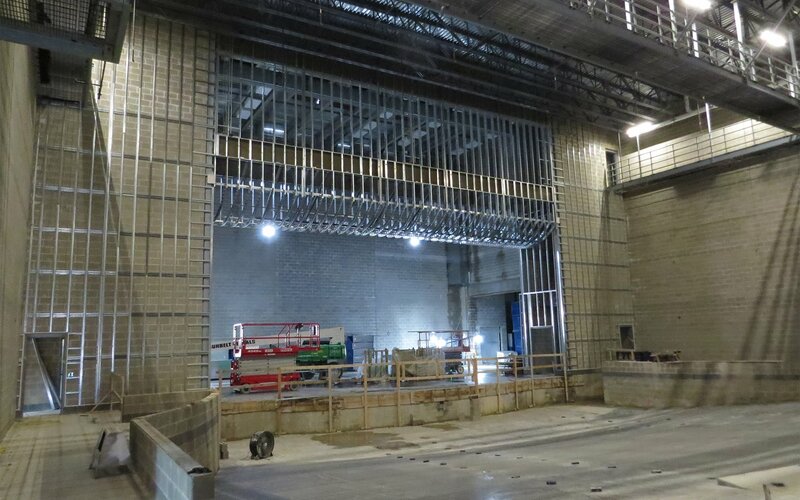 The new Thomas Jefferson High School, slated to be complete sometime during the 2018-19 school year, has a wing focused on the arts with a 1,000-seat auditorium. Thomas Jefferson 2.0 is being designed for about 1,000 students. There are currently 880 students at the old TJ, where the heating and cooling system needs to be replaced and the technology systems can’t handle today’s modern offerings. Technology is a “hodgepodge” in the building as its been added piece by piece and the building doesn’t have many energy-saving features like LED lights, Snodgrass said. Though the new building’s two large rotundas are “beautiful architecture,” Snodgrass said, they serve a purpose. The areas will be vestibules that restrict access from the remainder of the school. Safety is a major focus of the district, Snodgrass said. The district also is adding a districtwide access control system that will only provide entry to buildings through a scannable ID badge and code unique to that person. The district will be able to track who entered what door at what time and what doors are open when. As part of its safety measures, West Jefferson Hills added a school safety director in the last year. It also has a school resource officer located in Pleasant Hills. The district also is adding three school police officers for 2018-19. Clairton has security guards and metal detectors in place. However, as McCloskey looked around the aging facilities, other than added staffing, the one thing he said he wished the district had funding for is a school resource officer. Clairton has paid security staff, but not school police or a school resource officer. A school resource officer “could help students and staff here feel safe, and I think it could help build trust and bond between the police department and our community,” McCloskey said. This could allow students to see police in a different light, he said. Clairton has only been able to make the “bare minimum” fixes on its building. At the new TJ, another showpiece is the eight-lane pool, which will be incorporated into physical education classes and opened to the community, Snodgrass said. Clairton has a pool inside its school, yet it’s been dormant and in need of repairs for decades. The room is often used for storage. Livingston estimates it would cost several million dollars to repair the pool. 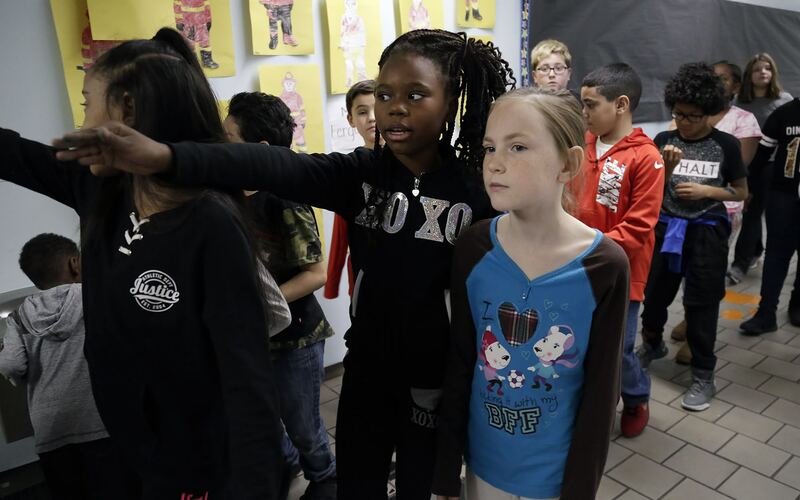 As it continues to grow, West Jefferson Hills is in the midst of redistricting its three elementary schools to create two K-2 schools and a 3-5 school. It is also working to expand Gill Hall Elementary to meet the growing needs of the district. District leaders talk about the desire to be a leader in education and they’re working to get their facilities there. An energy-saving program underway will add air conditioning to Jefferson — which became Jefferson Hills Intermediate School for the 2018-19 school year — and LED lighting and other upgrades to McClellan Elementary and Pleasant Hills Middle Schools. In all, West Jefferson Hills has spent $55 million on capital improvement projects in the last five years. The district, in 2017-18, had $110 million in debt. Clairton, however, has only been able to make the “bare minimum” fixes on its building, Nicolette said. The district has $1 million in its fund balance, lower than Nicolette said he is comfortable with. “It’s extremely frustrating because it’s not fair,” Livingston said. Clairton once was a booming steel town. It had it all, thriving businesses, a healthy population and a flourishing school system. “The people that lived here thought they were in heaven,” said Tachoir, who has lived in the district for 46 years. In the 1960s, Clairton residents were making so much money off of the steel mill, that they decided to go build themselves a new and better community, Tachoir said. So, they created communities like Jefferson Hills and Pleasant Hills. The connections between the two districts run deep. Many people in the West Jefferson Hills School District once lived in Clairton, Tachoir said, a sentiment echoed by Cherpak. “All of these people here grew up in Clairton,” Cherpak said. During the 1970s, Tachoir talks about racial unrest in the Clairton City School District. At the time, about a third of the students were black. With U.S. Steel downsizing, many people moved out. Today, Clairton School District is 67 percent black and 20 percent white. West Jefferson Hills is 93 percent white and 2 percent black. By the 1980s, Clairton was struggling financially. It was put under a state board of control, said Tachoir, who was a union leader at the time. At the time, it sought out a merger from all of its surrounding districts — including West Jefferson Hills, he said. They all said no. In 1993, the district again was put under a state board of control. Again in 2011, when Gov. Tom Corbett visited the district and shared his beliefs that there should be fewer districts in the state, Clairton went to its neighbors to see if they would be willing to merge, Livingston said. Ghilani said he was unaware of the vote to merge districts in 2011 and still doesn’t think merging districts — no matter the area — is a good idea. Ghilani said the state needs to adequately fund schools across the commonwealth and take the burden of funding districts off of property owners, while finding a way to subsidize districts that need the help. 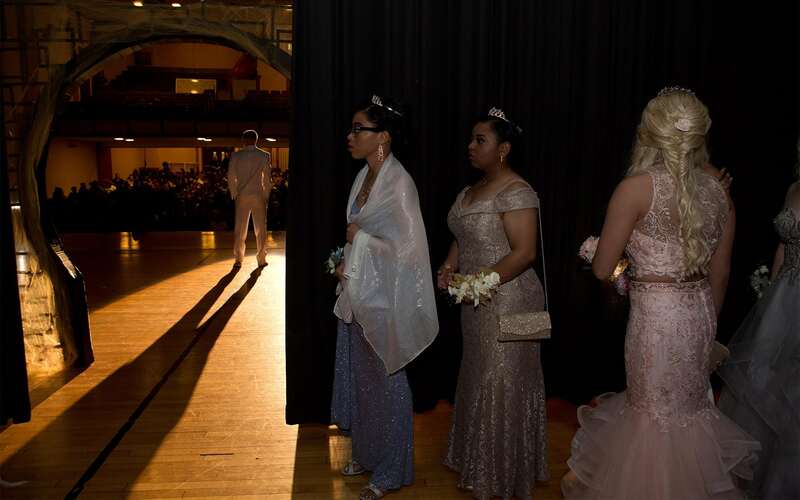 Candidates for prom queen await introduction backstage during the 2018 Clairton Promenade. Nicolette points to public school districts’ obligation to pay for students that attend charter schools as another financial drain. “It really is a self-fulfilling prophecy, though. When we don’t have the programs, what attracts students to come to Clairton?” he said. The youngsters have their own ideas: “One big school where Clairton and Jefferson kids could all be friends,” Clairton fourth grader Jovane Stephens Jr. imagined aloud in November. West Jefferson Hills is looking to open an environmental center at its new high school and plans to seek partners from other districts, like Clairton, to utilize the space. The district also plans to launch a STEAM camp that could bring together the students from multiple districts. While that’s a way they can work together, Clairton’s financial problems still remain. Is there a fix and how much would it take? That’s a tough question, leaders say. *The Heinz Endowments provides funding to PublicSource.